Too often, the end results of market segmentation research end up collecting dust on a marketing manager’s bookshelf. Why? Because he or she cannot use the results to identify the segments and bring them to life in the real world. 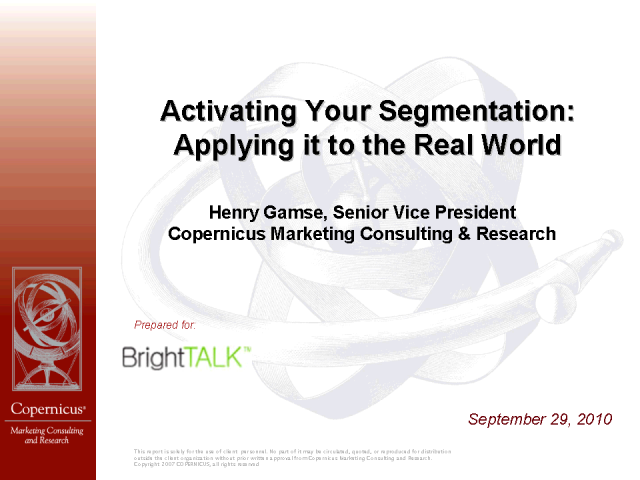 In this webcast, Copernicus’ in-house market segmentation guru Henry Gamse will help you turn this situation around. • Ways to identify and leverage your segments in real world situations. • A variety of databases where your segments can be accurately classified, profiled, and reached through targeted marketing efforts. • Techniques to accurately recruit the segment members you want for more profitable sales or future research. • Understanding your options and prioritizing your goals for fully leveraging the segments in the real world.